Private coaching sessions are the perfect opportunity for you to develop those areas of your game most important to you. 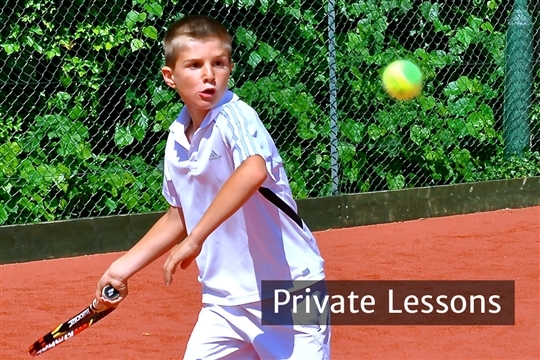 Our team of first class tennis coaches each have experience of playing tennis at a high level and work hard to tailor coaching sessions to suit the needs of individual players. Our Coaching Team are available seven days a week for private lessons (1-2 players). Charles is the Head Coach and runs the Telford Park Coaching Programme. Charles coaches all levels of player from beginner to performance, he competes in the county leagues and is club doubles champion. Sebastien coaches players of all ages and levels. He is responsible for all Junior competition at Telford Park including junior teams and tournaments and is club men's singles champion. Dave has been at Telford Park for 37 years and holds 20 Club Championship titles! Dave is a great coach for all levels of player. Luka is a great coach for performance players. Luka has played Novak Djokovic before and taken 4 games! He has aslo beaten Marin Cilic as a junior. When Luka was competing he gained 2 ATP tour ranking points. Casey has won the Surrey County Championship 4 times has achieved a rating of 2.0. He is a great coach for Advanced level players.